valley of the Quinnipiac River in Connecticut. Its first settlers were 38 planters and their families, who arrived in 1670. The land proved to be productive for farming and orchards. Many years after its founding, Wallingford flourished as a center for the making of silver hollowware and flatware. With names such as Wallace, Simpson, Rogers, Elton, Hall, Miller, International Silver, the Community (a commune, which later joined the Oneida, New York community), and later Boardman, Wallingford became known throughout the country. 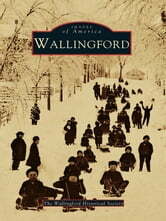 Unique areas of Wallingford such as Yalesville, Tracy, Pond Hill, North Farms, and Cook Hill sprang up, taking on the names of the people who started businesses and farms there. Today, although most of the farms and the silver industry have disappeared, Wallingford still has a thriving industry and rural expanses. Revering its heritage, the community has worked hard to achieve this balance as it has gone forward to meet the challenges of the present and future.